Course of the spinal accessory nerve (SAN) in the posterior cervical triangle. DG = posterior belly of digastric muscle; T = trapezius; LS = levator scapulae; IJV = internal jugular vein; black arrow = SAN. Interest in methods for evaluating SAN function and changes after surgical neck dissection have led to the use of various diagnostic modalities, such as electromyography (EMG) and ultrasonography. [6, 7, 8] Likewise, methods of nerve repair following surgical injury have been also been investigated. Harris and Dickey first described a cable grafting technique to restore SAN function. Gou et al have described an alternative technique for SAN reconstruction that used a sternocleidomastoid muscle—greater auricular nerve (GAN) flap, with the advantage of having an interpositioned graft vascularized by fascia and muscle with no donor site morbidity. Diagnostic methods and nerve-salvaging strategies are discussed in further detail in the Workup section. SAN injury results in shoulder dysfunction that affects the overall quality of life. Currently, several treatment options with predictable results are available to manage patients diagnosed with SAN trauma, provided the appropriate treatment is initiated in a timely fashion. Major pitfalls in early management of SAN injury include failure to recognize or acknowledge the injury and choosing conservative management in the hope that function will return without intervention. The incidence of serious sequelae can be reduced by maintaining a high index of suspicion for SAN injury. Early identification and timely intervention consequently results in better therapeutic outcomes. The dissection of level IIB is also a topic of controversy. It was previously presumed that preservation of zone IIB and consequently reduced manipulation of the SAN in a lateral neck dissection would result in less postoperative shoulder dysfunction. However, reports do not support this assumption. Other, less frequent causes of SAN injury are listed below (see Etiology). Pain can radiate to the neck and upper back and occasionally to the ipsilateral arm. Pain may worsen when the weight of the involved shoulder is not supported, placing strain upon the shoulder joint. Diminished strength when performing regular daily activities (eg, placing dishes in overhead shelves, exercises that involve bearing weight on the shoulders). 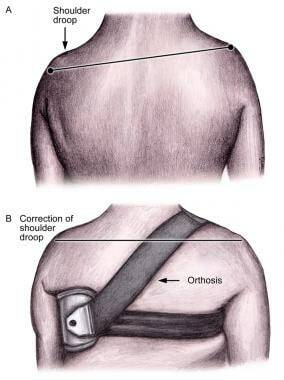 Limited or loss of sustained abduction of the shoulder is the most common sign. A full passive range of motion may eventually progress to decreased passive range of motion due to adhesive capsulitis (frozen shoulder). The ipsilateral shoulder may droop. Scapular winging or prominence of the medial border of the scapula and protraction may be found. Internal rotation of the humeral head may be found. Atrophy of trapezius muscle may be found. Myofascial pain syndromes of the shoulder girdle region: The absence of significant muscular atrophy and weakness and the absence of scapular winging differentiate this syndrome from SAN injury. The spinal accessory nerve (SAN) is formed by 2 parts. The spinal or motor portion includes fibers that originate in the ventral horn of the upper 4 or more cervical segments of the spinal cord. The fibers may originate from as low as the fifth and rarely the seventh cervical segment. These fibers ascend lateral and parallel to the spinal cord, entering the skull through the foramen magnum. These fibers join the second or accessory component of the SAN that originates in the nucleus accumbens brain stem nucleus of the medulla oblongata in the posterior fossa. The 2 parts of the SAN, now joined, leave the skull through the jugular foramen in the same dural compartment as the vagus nerve. The nerve passes through the jugular foramen and then divides variably into the 2 original components. The superior branch, also known as the accessory or internal branch, joins the vagus either directly or through the ganglion nodosum and then contributes to the pharyngeal, laryngeal, and cardiac sympathetic fibers. In the posterior neck, the SAN has a superficial and unpredictable course beneath the superficial cervical fascia that makes it vulnerable to injury. It is embedded in fibrofatty tissue and is found in relation to a group of 5-10 superficial nodes. Several anatomic landmarks and important variations in its course require careful consideration while identifying the nerve. Shoulder orthosis for scapulohumeral alignment. In the upper neck, 2 arrangements of the SAN have been described in relation to the internal jugular vein (IJV). In the more common (75-90%) anterior variant, the SAN nerve crosses in front of the IJV; in the less common (10-25%) variant, the nerve crosses behind the vein (see the first image below). Rarely, the SAN may traverse a divided IJV and appear to travel through the lumen of the vein (see the second image below). 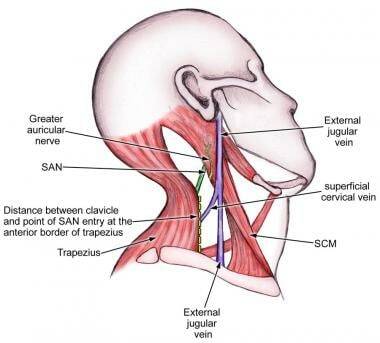 [32, 33] The SAN may also be palpable as a cord as it runs through the upper neck beneath the SCM muscle, dividing zone II into levels IIA and IIB. This often serves as a guide to the surgeon to begin nerve identification. 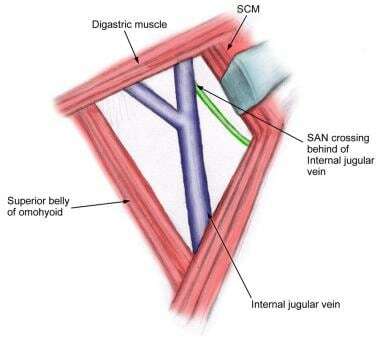 Relationship of internal jugular vein to the spinal accessory nerve (SAN). Spinal accessory nerve (SAN) posterior to the internal jugular vein. The SAN is known to form a plexus prior to its insertion into the trapezius. Shiozaki et al described 5 types of innervation of the trapezius by the main trunk of the SAN and its branches, in which the number of branches that innervate the muscle ranged from 0-4. More importantly, greater branching in the nerves seems to be associated with a thinner main trunk. Kim DH, Cho YJ, Tiel RL, et al. Surgical outcomes of 111 spinal accessory nerve injuries. Neurosurgery. 2003 Nov. 53(5):1106-12; discussion 1102-3. [Medline]. Brown H, Burns S, Kaiser CW. The spinal accessory nerve plexus, the trapezius muscle, and shoulder stabilization after radical neck cancer surgery. Ann Surg. 1988 Nov. 208(5):654-61. [Medline]. Sonne J, Lopez-Ojeda W. Neuroanatomy, Cranial Nerve. 2017 Jun. [Medline]. [Full Text]. Salerno G, Cavaliere M, Foglia A, et al. The 11th nerve syndrome in functional neck dissection. Laryngoscope. 2002 Jul. 112(7 Pt 1):1299-307. [Medline]. Ewing MR, Martin H. Disability following radical neck dissection; an assessment based on the postoperative evaluation of 100 patients. Cancer. 1952 Sep. 5(5):873-83. [Medline]. Bodner G, Harpf C, Gardetto A, et al. Ultrasonography of the accessory nerve: normal and pathologic findings in cadavers and patients with iatrogenic accessory nerve palsy. J Ultrasound Med. 2002 Oct. 21(10):1159-63. [Medline]. Tsuji T, Tanuma A, Onitsuka T, et al. Electromyographic findings after different selective neck dissections. Laryngoscope. 2007 Feb. 117(2):319-22. [Medline]. Zibordi F, Baiocco F, Bascelli C, et al. Spinal accessory nerve function following neck dissection. Ann Otol Rhinol Laryngol. 1988 Jan-Feb. 97(1):83-6. [Medline]. Harris HH, Dickey JR. Nerve grafting to restore function of the trapezius muscle after radical neck dissection. (A preliminary report). Ann Otol Rhinol Laryngol. 1965 Sep. 74(3):880-6. [Medline]. Guo CB, Zhang Y, Zou LD, et al. Reconstruction of accessory nerve defects with sternocleidomastoid muscle-great auricular nerve flap. Br J Plast Surg. 2005 Mar. 58(2):233-8. [Medline]. Chandawarkar RY, Cervino AL, Pennington GA. Management of iatrogenic injury to the spinal accessory nerve. Plast Reconstr Surg. 2003 Feb. 111(2):611-7; discussion 618-9. [Medline]. Leipzig B, Suen JY, English JL, et al. Functional evaluation of the spinal accessory nerve after neck dissection. Am J Surg. 1983 Oct. 146(4):526-30. [Medline]. Prim MP, De Diego JI, Verdaguer JM, et al. Neurological complications following functional neck dissection. Eur Arch Otorhinolaryngol. 2006 May. 263(5):473-6. [Medline]. Cappiello J, Piazza C, Giudice M, et al. Shoulder disability after different selective neck dissections (levels II-IV versus levels II-V): a comparative study. Laryngoscope. 2005 Feb. 115(2):259-63. [Medline]. Popovski V, Benedetti A, Popovic-Monevska D, Grcev A, Stamatoski A, Zhivadinovik J. Spinal accessory nerve preservation in modified neck dissections: surgical and functional outcomes. Acta Otorhinolaryngol Ital. 2017 Oct. 37 (5):368-74. [Medline]. [Full Text]. Keles Z, Zinnuroglu M, Beyazova M. Impairment of upper trapezius branch of the spinal accessory nerve during bypass grafting: a stretch injury?. Muscle Nerve. 2010 Jan. 41(1):144-7. [Medline]. Millett PJ, Romero A, Braun S. Spinal accessory nerve injury after rhytidectomy (face lift): a case report. J Shoulder Elbow Surg. 2009 Sep-Oct. 18(5):e15-7. [Medline]. Bodack MP, Tunkel RS, Marini SG, et al. Spinal accessory nerve palsy as a cause of pain after whiplash injury: case report. J Pain Symptom Manage. 1998 May. 15(5):321-8. [Medline]. Khalid S, Zaheer S, Khalid M, et al. Collet-Sicard syndrome secondary to a large glomus jugulotympanicum. Ann Saudi Med. 2013 Jul-Aug. 33(4):407-10. [Medline]. Jo YR, Chung CW, Lee JS, et al. Vernet syndrome by varicella-zoster virus. Ann Rehabil Med. 2013 Jun. 37(3):449-52. [Medline]. [Full Text]. Kassem MW, Iwanaga J, Loukas M, et al. Accessory neuropathy after sternotomy: clinico-anatomical correlation supporting an inflammatory cause. Clin Anat. 2017 Nov 28. [Medline]. Ozdemir O, Kurne A, Temucin C, et al. Spontaneous unilateral accessory nerve palsy: a case report and review of the literature. Clin Rheumatol. 2007 Sep. 26(9):1581-3. [Medline]. Kierner AC, Burian M, Bentzien S, et al. Intraoperative electromyography for identification of the trapezius muscle innervation: clinical proof of a new anatomical concept. Laryngoscope. 2002 Oct. 112(10):1853-6. [Medline]. Macaluso S, Ross DC, Doherty TJ, Doherty CD, Miller TA. Spinal accessory nerve injury: a potentially missed cause of a painful, droopy shoulder. J Back Musculoskelet Rehabil. 2016 Nov 21. 29 (4):899-904. [Medline]. Nahum AM, Mullally W, Marmor L. A syndrome resulting from radical neck dissection. Arch Otolaryngol. 1961 Oct. 74:424-8. [Medline]. Piazza C, Cappiello J, Nicolai P. Sternoclavicular joint hypertrophy after neck dissection and upper trapezius myocutaneous flap transposition. Otolaryngol Head Neck Surg. 2002 Feb. 126(2):193-4. [Medline]. Shiozaki K, Abe S, Agematsu H, et al. Anatomical study of accessory nerve innervation relating to functional neck dissection. J Oral Maxillofac Surg. 2007 Jan. 65(1):22-9. [Medline]. Overland J, Hodge JC, Breik O, Krishnan S. Surgical anatomy of the spinal accessory nerve: review of the literature and case report of a rare anatomical variant. J Laryngol Otol. 2016 Oct. 130 (10):969-72. [Medline]. Lanisnik B. Different branching patterns of the spinal accessory nerve: impact on neck dissection technique and postoperative shoulder function. Curr Opin Otolaryngol Head Neck Surg. 2017 Apr. 25 (2):113-8. [Medline]. Tubbs RS, Stetler W, Louis RG Jr, Gupta AA, Loukas M, Kelly DR, et al. Surgical challenges associated with the morphology of the spinal accessory nerve in the posterior cervical triangle: functional or structural?. J Neurosurg Spine. 2010 Jan. 12(1):22-4. [Medline]. Hone SW, Ridha H, Rowley H, et al. Surgical landmarks of the spinal accessory nerve in modified radical neck dissection. Clin Otolaryngol Allied Sci. 2001 Feb. 26(1):16-8. [Medline]. Gardiner KJ, Irvine BW, Murray A. Anomalous relationship of the spinal accessory nerve to the internal jugular vein. Clin Anat. 2002 Jan. 15(1):62-3. [Medline]. Gray HR, Warwick PL, Williams. Gray's anatomy. 36th ed. Philadelphia Edingurgh; New York Churchill Livingstone: Saunders; xvii 1578; 1980. Chepeha DB, Taylor RJ, Chepeha JC, et al. Functional assessment using Constant's Shoulder Scale after modified radical and selective neck dissection. Head Neck. 2002 May. 24(5):432-6. [Medline]. Salgarelli AC, Landini B, Bellini P, Multinu A, Consolo U, Collini M. A simple method of identifying the spinal accessory nerve in modified radical neck dissection: anatomic study and clinical implications for resident training. Oral Maxillofac Surg. 2009 Jun. 13(2):69-72. [Medline]. Erisen L, Basel B, Irdesel J, et al. Shoulder function after accessory nerve-sparing neck dissections. Head Neck. 2004 Nov. 26(11):967-71. [Medline]. Witt RL, Rejto L. Spinal accessory nerve monitoring in selective and modified neck dissection. Laryngoscope. 2007 May. 117(5):776-80. [Medline]. Constant CR, Murley AH. A clinical method of functional assessment of the shoulder. Clin Orthop Relat Res. 1987 Jan. 160-4. [Medline]. Rogers SN, Scott B, Lowe D. An evaluation of the shoulder domain of the University of Washington quality of life scale. Br J Oral Maxillofac Surg. 2007 Jan. 45(1):5-10. [Medline]. Teboul F, Bizot P, Kakkar R, et al. Surgical management of trapezius palsy. J Bone Joint Surg Am. 2004 Sep. 86-A(9):1884-90. [Medline]. Gordon SL, Graham WP 3rd, Black JT, et al. Acessory nerve function after surgical procedures in the posterior triangle. Arch Surg. 1977 Mar. 112(3):264-8. [Medline]. Kizilay A, Kalcioglu MT, Saydam L, et al. A new shoulder orthosis for paralysis of the trapezius muscle after radical neck dissection: a preliminary report. Eur Arch Otorhinolaryngol. 2006 May. 263(5):477-80. [Medline]. Akgun K, Aktas I, Uluc K. Conservative treatment for late-diagnosed spinal accessory nerve injury. Am J Phys Med Rehabil. 2008 Dec. 87(12):1015-21. [Medline]. McGarvey AC, Hoffman GR, Osmotherly PG, et al. Maximizing shoulder function after accessory nerve injury and neck dissection surgery: A multicenter randomized controlled trial. Head Neck. 2014 Jul 11. [Medline]. Osgaard O, Eskesen V, Rosenørn J. Microsurgical repair of iatrogenic accessory nerve lesions in the posterior triangle of the neck. Acta Chir Scand. 1987 Mar. 153(3):171-3. [Medline]. Weisberger EC, Kincaid J, Riteris J. Cable grafting of the spinal accessory nerve after radical neck dissection. Arch Otolaryngol Head Neck Surg. 1998 Apr. 124(4):377-80. [Medline]. Maldonado AA, Spinner RJ. Lateral pectoral nerve transfer for spinal accessory nerve injury. J Neurosurg Spine. 2017 Jan. 26 (1):112-5. [Medline]. Dvali L, Mackinnon S. Nerve repair, grafting, and nerve transfers. Clin Plast Surg. 2003 Apr. 30(2):203-21. [Medline]. Millesi H, Meissl G, Berger A. The interfascicular nerve-grafting of the median and ulnar nerves. J Bone Joint Surg Am. 1972 Jun. 54(4):727-50. [Medline]. Maki Y, Firrell JC, Breidenbach WC. Blood flow in mobilized nerves: results in a rabbit sciatic nerve model. Plast Reconstr Surg. 1997 Sep. 100(3):627-33; discussion 634-5. [Medline]. Ducic I, Maloney CT Jr, Dellon AL. Reconstruction of the spinal accessory nerve with autograft or neurotube? Two case reports. J Reconstr Microsurg. 2005 Jan. 21(1):29-33; discussion 34. [Medline]. den Dunnen WF, van der Lei B, Schakenraad JM, et al. Poly(DL-lactide-epsilon-caprolactone) nerve guides perform better than autologous nerve grafts. Microsurgery. 1996. 17(7):348-57. [Medline]. Meek MF, Den Dunnen WF, Schakenraad JM, et al. Long-term evaluation of functional nerve recovery after reconstruction with a thin-walled biodegradable poly (DL-lactide-epsilon-caprolactone) nerve guide, using walking track analysis and electrostimulation tests. Microsurgery. 1999. 19(5):247-53. [Medline]. Lange M. [Treatment of paralysis of the trapezius.]. Langenbecks Arch Klin Chir Ver Dtsch Z Chir. 1951 Nov 17. 270:437-9. [Medline]. Donner TR, Kline DG. Extracranial spinal accessory nerve injury. Neurosurgery. 1993 Jun. 32(6):907-10; discussion 911. [Medline]. Kraus DH, Rosenberg DB, Davidson BJ, et al. Supraspinal accessory lymph node metastases in supraomohyoid neck dissection. Am J Surg. 1996 Dec. 172(6):646-9. [Medline]. Eickmeyer SM, Walczak CK, Myers KB, et al. Quality of life, shoulder range of motion, and spinal accessory nerve status in 5-year survivors of head and neck cancer. PM R. 2014 Dec. 6(12):1073-80. [Medline]. [Full Text]. Park SH, Esquenazi Y, Kline DG, Kim DH. Surgical outcomes of 156 spinal accessory nerve injuries caused by lymph node biopsy procedures. J Neurosurg Spine. 2015 Oct. 23 (4):518-25. [Medline]. Goransson H, Leppanen OV, Vastamaki M. Patient outcome after surgical management of the spinal accessory nerve injury: A long-term follow-up study. SAGE Open Med. 2016. 4:2050312116645731. [Medline]. [Full Text]. Lanisnik B, Zitnik L, Levart P, Zargi M, Rodi Z. The impact on post-operative shoulder function of intraoperative nerve monitoring of cranial nerve XI during modified radical neck dissection. Eur Arch Otorhinolaryngol. 2016 Dec. 273 (12):4445-51. [Medline]. Birinci Y, Genc A, Ecevit MC, et al. Spinal Accessory Nerve Monitoring and Clinical Outcome Results of Nerve-Sparing Neck Dissections. Otolaryngol Head Neck Surg. 2014 Aug. 151 (2):253-9. [Medline]. McGarvey AC, Hoffman GR, Osmotherly PG, Chiarelli PE. Intra-operative monitoring of the spinal accessory nerve: a systematic review. J Laryngol Otol. 2014 Sep. 128 (9):746-51. [Medline]. Surgical landmarks for the identification of the spinal accessory nerve (SAN). Algorithm for management of spinal accessory nerve (SAN) injury. Surgical management for spinal accessory nerve (SAN) injury and preoperative delay in diagnosis. The author would like to thank Dr. A.K. D’Cruz, MS, DNB, Professor and Chairman, Head/Neck Surgery, Tata Memorial Hospital, Mumbai, India, for Image 7, and Dr. Umamaheshwar Duvvuri, MD, PhD, Fellow, Head/Neck Surgery, MD Anderson Cancer Center, Houston, Texas, for Image 8.